We are sorry but we don't have the AR20DL available anymore. We now have new version, the ARDX20 Dual Analog Delay, with many more features but the same great tone. Also the AMAZE0 tap-tempo and modulation controller is now available! We hope to have enough of them to avoid availability problems. Go to buyanalogman.com for more info and online ordering of the best analog delay available. ARDX20 receives the GUITAR PLAYER magazine EDITOR'S PICK AWARD in the April 2010 issue! Well I just couldn't stand it and I ordered one of your ARDX20's last week....I received it yesterday and after playing with it at the studio today here are my thoughts! First let me qualify this opinion by saying a tube style tape echo is the baddest delay known to man...With that said, understand that I sold mine and purchased the ARDX20! There are a few things that I will miss though. I'll miss the constant cleaning of the tape path and pinch roller. I'll miss having to make sure I have extra tapes packed up for every gig. I'll miss the motor noise and the unexplained quirk of the machine humming bad in some studios, other times not. I'll miss having to demag the heads too! I won't miss the tone, this has the same smooth liquid feel as the echoplex has. I won't miss the fact that you have to manually set up each tempo on the tape echo but have two presets with the ARDX20 with the ability to expand even on that! Thanks Mike for a wonderful pedal!! This is the old AR20DL and the information below is about this old version. This Analog Man AR20DL Analog Delay is a BASIC analog delay, think of it as like a Boss DM2 or DM3. 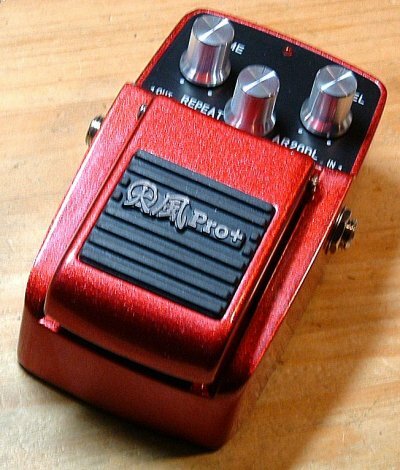 It's a basic pedal but the tone is really good. Like a DM2, it is not true bypass, but we tuned the buffer in it really well. So if you ever turn it off, you will have a nice strong signal going to your amp. I don't like more than a few buffers in your signal path, but if you have one, this is a good place for it to be (delays are usually at the end of your pedal chain). The old Ibanez AD80 and some early DM2 pedals used the 3005 chip which works best at high voltage (the old AD80 used two 9V batteries to get 18Volts, which was internally regulated to 12V). The Maxon AD900 was another awesome sounding analog delay which ran at 12V with 3005 or 3008 chips. But most people prefer 9V power supplies and battery power for ease of use, so we made this delay with the 3205 chip which runs on 8V to 9V just fine, like the later DM-2 and DM-3 and original AD-9 pedals. All delay pedals have two signal paths which are combined at the output - the "dry" signal (your normal sound) and the delayed or "wet" signal (the echoes or repeats). Our idea is to get a powerful tone, from a combination of the higher voltage (9V raw voltage) feeding the audio signal dry circuit, with good delay tone gotten from the wet BBD circuit driven by our internally regulated 8V supply. So we think the AR20DL has a similar tone to the DM-2 with a 9V power source, or the AD-900 with a 12V power source. Ours is tuned for a strong, warm, and clear dry normal tone, with the delays tuned for a little more upper mids and highs to get through, for a little more clarity than most of the old delays. The decays are tuned for a smooth decay also. This analog delay is SUPER easy to get self-oscillation/inifinite repeats going. Even at the longest delay time you don't have to turn the repeat knob up all the way. And it's not touchy like most delays, where it goes crazy and tries to destroy your amp and ears if you turn it up JUST A BIT too much. It's almost like a magic helping hand keeps the delays going but not to the point of pain. An Alkaline battery will probably last about 30 hours in this pedal as it uses only about 14mA of current. The XL version only uses about 1mA more so it's also good on power. But a good 9V Boss PSA type adaptor is your best bet. 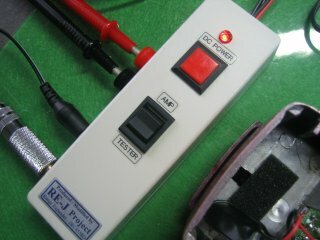 Other transformer-based power supplies like pedalpower2, T Rex Fuel Tank, Dunlop Brick, etc are also recommended. DO NOT use an old style carbon battery in this pedal or the tone may be too bright, even when bypassed. These delays are finely calibrated for an alkaline battery or a 9-10V dc regulated power supply. 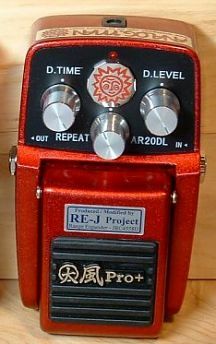 My Japanese collaborator Ohbayashi-san had been hoping to produce an original analog delay pedal like the good old Japanese DM-2. One day, he found a Daphon analog delay E20DL at a shop in Japan. He bought it and after analyzing it, he was so surprised that this pedal had the possibility to sound like a vintage DM-2 after some mods. After finding this, he contacted the Daphon company to tell them he would like to purchase a customized version of their analog delay pedal for RE-J/Japan and AnalogMan/USA. Then Ohbayashi-san actually went to the Daphon factory in China in March 2006 to meet with them. At the factory, RE-J Ohbayashi-san found some reason why Daphon's pedal has similar potential with Japanese vintage pedals like DM-2,3, CE-2 and etc. that was sold twenty years ago. After meeting with them, we specified our original specs for AR20DL: lighter weight boxes, moving center REPEAT knob closer for getting easier LED view, red sparkly DM-2,3 color, and some different chips like the New Old Stock 570 compander chip which is better than the 571 chip that almost everyone else uses. When we get the pedals from Daphon, we mod them further. We double the delay time with a 3205 chip like the Boss DM2/3. The stock 3208 chip really only works up to 150mS, after about halfway on the delay time knob there is too much noise and whistling. Delay time is about 300mS like most small delays. 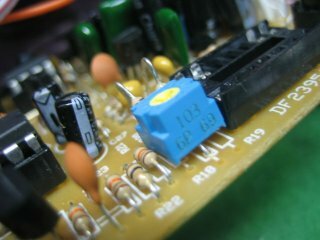 We also mod the power supply section to work well with a battery or a 9V to 12V power supply. We also add two trimpots (one is the blue thing on the left) for fine tuning the calibration, as the factory does not get calibration very close with fixed resistors. Poor calibration in an analog delay is why a lot of them will make whistling noises. Our delay is calibrated for the highest delay time with absolutely no whistling or odd sounds even at the highest delay time. We also modify the in and out jacks to make them much more reliable, and beef up the internal wiring also. But it's best not to open the pedal much, as there are no user adjustments inside. For example you cannot increase the delay time by turning any of the trim pots, you will just lose the echo or increase noise if they are moved from the calibrated positions. Daphon makes these red pedals to our special AR20DL design, so we can't do our mod to a stock grey Daphon pedal. Here is a cool piece of test equipment he came up with for calibrating and testing the delay. Donner put up a video on youtube . Fatback put another great video up on google. 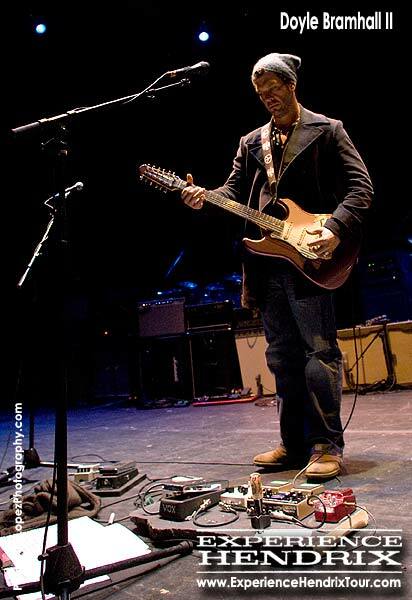 Here is one of Jim Weider playing his '52 Tele through the delay into his Fargen JW-40 amp at the AMP SHOW in May 2007. A Strat into our BC108 sunface and the delay into a Fender Blues Junior amp, from a customer W.J. Size : 5" long x 3" wide by 2 1/4" tall. We now have AR20DL-XL pedals available with longer delay time (600mS) if you are interested, for $50 more. To do this, we piggyback an extra delay chip on top of the normal chip and add circuitry to make it work. The sound is about the same, maybe a little louder/stronger. 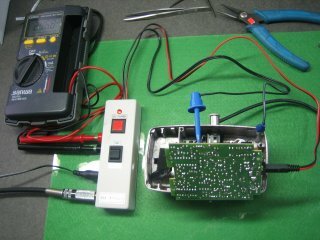 In Nov 2007 we started doing XL mods on AR20DL delay pedals. This doubles the delay time and cost is $75 plus S & H. Use our MODFORM which has all the info you need to send your pedal in for the mod. Price is $145 for the AR20DL for now. The XL option is $50 more at time of pedal order. One year warrantee to the original owner except for mechanical parts that are physically broken by dropping etc. These are no longer available in 2009. We were using our new website buyanalogman.com to sell these, click on this link to buy one. The website keeps track of the quantities of each standard and XL pedals so you can't order a pedal when they get sold out. The first batch of ten sold out within hours in mid March 2007. The second small batch of 12 sold out in one hour on Apr 17. We got 20 more on May 1st. On May 30th we sold 25, half in the morning and half in the early evening for fairness. We got 25 more on June 14th and sold most of them then. We got 24 more on June 21st and shipped some of them. We got more on July 9th and sold them all on the 11th. We got more on July 25th and sold them on the morning of the 26th. We got more on Aug 1st and sold them on that day. We got more on Aug 9th and sold them on that day. We got 30 more in mid Aug and sold them on Aug 26th. We got some more including XL in late Aug and sold them in early Sept. We got some more including XL in mid Sept and sold them the night of the 18th. We got mostly XL models in mid October and sold them the 15th. We got both models in mid November and sold them the 14th. We got both models in late November and sold them the 28-29th. We got both models in late February '08 and sold them the weekend of the 29th. We got both models in late April '08 and sold them the week of the 28th. We got XL pedals in mid July and another batch in mid August. Every now and then we got another BATCH of 24 pedals as seen on the left. Sorry we will not have any new waiting lists as they are already taking up too much of our time. Instead, we will let you know here when you can buy one when we have them available. If you are a good customer who has bought multiple pedals before 2007 let me know and I will tell you how to order now so you don't have to keep checking back. Thanks for your patience and interest!